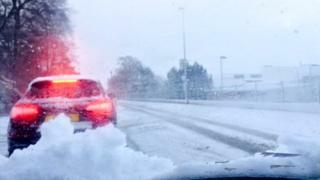 Snow and ice is causing problems on roads in the north east and has led to school closures. There have been a number of accidents, including a car ending up on its roof near Catterline in Aberdeenshire. A number of higher routes are closed completely while there were heavy rush hour delays on main routes heading into Aberdeen and also in the city itself. A number of schools in Aberdeenshire have been fully or partially closed, as well as facing transport problems. Long delays were reported southbound from the Toll of Birness to Aberdeen, and also reports of difficult driving conditions on the A90 around Stonehaven. Police urged drivers to take extra care.